A few hundred episodes ago, I answered the question, “What is the Universe Expanding Into?” The gist of the answer is that the Universe as we understand it, isn’t really expanding into anything. If you go in any one direction long enough, you just return to your starting point. As the Universe expands, that journey takes longer, but there’s still nothing that it’s going into. Okay, so, I need to put an asterisk on that answer, and then when you read the fine print it’d say something like, “unless we live in a multiverse”. One of the super interesting and definitely way out there ideas is that our cosmos to actually just one universe in a vast multiverse. Each universe is sort of like a soap bubble embedded in the cosmic void of the multiverse, expanding from its own Big Bang. And in each one of these universes, the laws of physics are completely different. There are actually a bunch of physical constants in the Universe, like the force of gravity or the binding strength of atoms. For each one of those basic constants, it’s as if the laws of physics randomly rolled the dice, and came up with our Universe – a place that’s almost, but not completely hostile to life. So imagine all these different bubble universes popping up in this vast cosmic foam of the multiverse, and the laws of physics are different. Maybe in another universe, the force of gravity is repulsive, or green, or spawns unicorns. In the vast majority of those universes, no life could ever form, but roll the dice an infinite number of times and you’ll eventually get the conditions for life. Any lifeform capable of perceiving the Universe had to evolve into a universe capable of life. Of course, this sounds like pseudo scientific mumbo jumbo, and next you’ll expect me to talk about chakras, astrology and channeling the spirit of Big Foot. However, hang on a second, this might actually be science. If these bubble universes got close enough, there might be a way they could rub together, to interact in ways that were detectable from within the Universe. In other words, we could look out into space and see a cosmic bruise, and know that’s where our universe is colliding with another one. Well, have astronomers looked out into space, in search of some sign that our Universe is interacting with other universes? Indeed they have, and they’ve found something really strange. When examining the Cosmic Microwave Background Radiation, the afterglow leftover from the Big Bang, astronomers have found a temperature fluctuations. These different temperatures, or anisotropies are regions where different densities of matter in the early Universe were scaled up to enormous scales by the ongoing expansion. While most of these differences in temperature are explained by the current cosmological theories for the Universe, there’s one region that defies the theories. It’s so strange, the researchers who discovered it hilariously named it the “Axis of Evil” after something some president said. Anyway, there are lots of ideas for what the Axis of Evil might be. Seriously, every single one of them is more reasonable and more likely than what I’m about to say. But one really fascinating idea is that we’re seeing a region where our Universe is bumping into another universe, violating each other’s laws of physics. So if this is the case, and astronomers are witnessing a universal interaction, what does this mean for the poor aliens who might be getting overlapped by the next universe over? We have no idea, but imagine what might happen as the laws of physics from two completely different universes overlap. What is the average of 7 and green? Or 26 and unicorn dreams? Whatever it is, it can’t be good for the aliens and their continued healthy existence. But don’t worry, that region is billions of light years away, and it’s probably not another universe anyway, we just need better observations. We covered this topic in great detail in episode 408 of Astronomy Cast, so if you want hear more from Dr. Pamela Gay, click here and watch the show. You’ll especially enjoy watching me pick up the shattered pieces of my brain as I try to wrap my head around this mind bending concept. Imagine if you were told that the world is simple and exactly as it seems, but that there is an infinite number of worlds just like ours. They share the same space and time, and interact with each other. These worlds behave as Newton first envisioned, except that the slightest interactions of the infinite number create nuances and deviations from the Newtonian mechanics. What could be deterministic is swayed by many worlds to become the unpredictable. This is the new theory about parallel universes explained by Australian and American theorists in a paper published in the journal Physics Review X. Called the “Many Interacting Worlds” theory (MIW), the paper explains that rather than standing apart, an infinite number of universes share the same space and time as ours. They show that their theory can explain quantum mechanical effects while leaving open the choice of theory to explain the universe at large scales. This is a fascinating new variant of Multiverse Theory that, in a sense, creates not just a doppelganger of everyone but an infinite number of them all overlaying each other in the same space and time. Rather than island universes as proposed by other multiverse theories, Many Interacting Worlds (MIW) proposes many all lying within one space and time. Cosmology is a study in which practitioners must transcend their five senses. Einstein referred to thought experiments, and Dr. Stephen Hawking — surviving and persevering despite having ALS — has spent decades wondering about the Universe and developing new theories, all within his mind. The “Many Interacting Worlds” theory, presented by Michael Hall and Howard Wiseman from Griffith University in Australia, and Dirk-André Deckert from the University of California, Davis, differs from previous multiverse theories in that the worlds — as they refer to universes — coincide with each other, and are not just parallel. The theorists explain that while the interactions are subtle, the interaction of an infinite number of worlds can explain quantum phenomena such as barrier tunneling in solid state electronics, can be used to calculate quantum ground states, and, as they state, “at least qualitatively” reproduce the results of the double-slit experiment. Schrödinger, in explaining his wave function and the interaction of two particles (EPR paradox) coined the term “entanglement”. In effect, the MIW theory is an entanglement of an infinite number of worlds but not in terms of a wave function. The theorists state that they were compelled to develop MIW theory to eliminate the need for a wave function to explain the Universe. It is quite likely that Einstein would have seen MIW as very appealing considering his unwillingness to accept the principles laid down by the Copenhagen interpretation of Quantum Theory. While MIW theory can reproduce some of the most distinctive quantum phenomena, the theorists emphasize that MIW is in an early phase of development. They state that the theory is not yet as mature as long-standing unification theories. In their paper, they use Newtonian physics to keep their proofs simple. Presenting this new “many worlds” theory indicates they had achieved a level of confidence in its integrity such that other theorists can use it as a starter kit – peer review but also expand upon it to explain more worldly phenomena. Two of the perpetrators of the century-long problem of unifying General Relativity Theory and Quantum Physics – Albert Einstein, Erwin Schroedinger. The theorists continue by expounding that MIW could lead to new predictions. If correct, then new predictions would challenge experimentalists and observers to recreate or search for the effects. Such was the case for Einstein’s Theory of General Relativity. For example, the bending of the path of light by gravity and astronomer Eddington’s observing starlight bending around Sun during a total Solar Eclipse. Such new predictions and confirmation would begin to stand MIW theory apart from the many other theories of everything. Hugh Everett’s reinterpretation of Dr. Richard Feynman’s cosmological theory, that the world is a weighted sum of alternative histories, states that when particles interact, reality bifurcates into a set of parallel streams, each being a different possible outcome. In contrast to Feynmann’s theory and Everett’s interpretation, the parallel worlds of MIW do not bifurcate but simply exist in the same space and time. MIW’s parallel worlds are not a consequence of “quantum behavior” but are rather the drivers of it. Hall states in the paper that simple Newtonian Physics can explain how all these worlds evolve. This, they explain, can be used effectively as a first approximation in testing and expanding on their theory, MIW. Certainly, Einstein’s Special and General Theories of Relativity completes the Newtonian equations and are not dismissed by MIW. However, the paper begins with the simpler model using Newtonian physics and even explains that some fundamental behavior of quantum mechanics unfolds from a universe comprised of just two interacting worlds. So what is next for the Many Interacting Worlds theory? Time will tell. Theorists and experimentalists shall begin to evaluate its assertions and its solutions to explain known behavior in our Universe. With new predictions, the new challenger to Unified Field Theory (the theory of everything) will be harder to ignore or file away with the wide array of theories of the last 100 years. Einstein’s theories began to reveal that our world exudes behavior that defies our sensibility but he could not accept the assertions of Quantum Theory. Einstein’s retort to Bohr was “God does not throw dice.” The MIW theory of Hall, Deckert, and Wiseman might be what Einstein was seeking until the end of his life. For MIW theory, one world is not enough and for these many worlds their interactions might be compared to a martini shaken but not stirred. The Universe is big, but how big is it? That all depends on whether the Universe is finite or infinite. Even the word “big” is tough to get clear. Are we talking about the size of the Universe we can see, or the Universe’s actual size right now? The Universe is big, but how big is it? And what the heck kind of question is that? Are elephants big? Trucks? Dinosaurs? Cheese? Is cheese big? How big is cheese? How big is big? The word “big” is tough to get clear. Are we talking about the size of the Universe we can see, or the Universe’s actual size right now? This becomes even more complicated when we are trying to work under assumptions of either the Universe is finite or the Universe is infinite. One difficulty with talking about the size, is that the Universe is expanding. Light takes time to travel from distant galaxies, and while that light travels, the Universe continues to expand. So our problem with talking about how big it is, is that there is no single meaning to distance when it comes to the universe. For this reason, astronomers usually don’t worry about the distance to galaxies at all, and instead focus on redshift, which is measured by z. The bigger the z, the more redshift, and the more distant the galaxy. As an example, consider one of the most distant galaxies we’ve observed, which has a redshift of 7.5. Using this, we can determine distance by calculating how long the light has traveled to reach us. With a redshift of 7.5, that comes out to be about 13 billion years. You might think that means it’s 13 billion light years away, but 13 billion years ago the universe was smaller, so it was actually closer at the time the light left that galaxy. Using this, if you calculate that distance, it was only a short 3.4 billion light years away. Now the galaxy is much farther than that. After the light left the galaxy, the galaxy continued to move away from us. It is now about 29 billion light years away. Which is definitely more than 13, and quite a bit more than its original 3.4. Usually it is this big distance that people mean when they ask for the size of the universe. This is known as the co-moving distance. Of course, we can only see so far. So, how far can we see? The most distant light we are able to observe is from the cosmic microwave background, which has a redshift of about z = 1,000. This means the co-moving distance of the cosmic background is about 46 billion light years. Sticking us at the center of a massive sphere, the currently observable universe has a diameter of about 92 billion light years. Even with this observed distance, we know that it extends much further than that. If what we could see was all there is, we would see galaxies tend to gravitate towards us, which we don’t observe. In fact we don’t see any kind of galaxy clumping to a particular point at all. So as far as we know the universe could extend forever. It could be even stranger than that. Despite some media controversy, if the BICEP2 detection of early inflation is correct, it is likely the Universe undergoes a type of inflation with the intimidating moniker of “eternal inflation”. If it is the case, our observable universe is merely one bubble within an endless sea of other bubble universes. This is otherwise referred to as… the multiverse. What do you think? Does the Universe go on for ever? Tell us in the comments below. And if you like what you see, come check out our Patreon page and find out how you can get these videos early while helping us bring you more great content! Editor’s note: Peter Shaver is the author of the new book “Cosmic Heritage – Evolution from the Big Bang to Conscious Life.” Find out here how you can win a copy! The universe has gone through a number of distinct phases. The first part of the first second is speculative, but the physics of the latter part is well know to us. In the first several minutes the lightest elements (hydrogen and helium) were formed. Over the next 380,000 years the universe was a hot (but always cooling) plasma of electrons, nuclei and photons. At 380,000 years it was cool enough for electrons and nuclei to combine into atoms, in a process called recombination. The photons were freed from the plasma, and the universe became transparent for the first time. As the universe was opaque before recombination and transparent after, we see this epoch as a ‘wall’, and it is known as the cosmic microwave background. What followed was a period known as the ‘cosmic dark ages’. The only light was that of the fading afterglow of the Big Bang, and the matter was comprised of the primordial elements and the exotic ‘dark matter’. During this time gravitational accretion slowly but surely produced larger and larger concentrations of matter, and when these became sufficiently dense, nuclear reactions could form and the first stars and galaxies were born. These lit up and ionized the universe again, some 400-500 million years after the Big Bang, in what is known as the ‘reionization epoch’. The activity increased exponentially, culminating in the ‘quasar epoch’ 2-4 billion years after the Big Bang, a frenetic period of chaotic star and galaxy formation, galaxy interactions, monster quasars and radio galaxies. This activity eventually began to drop off, although it still continues today; the incidence of quasars today is a thousand times less than it was at the peak of the quasar epoch. At 13.7 billion years, the universe has now reached a ‘dignified middle age’. The ‘heavy elements’ such as carbon and oxygen, essential for life as we know it, are all produced in stars, and this process has been going on ever since the first stars formed. Each generation of stars ejects more heavy elements into the intergalactic medium, so the abundances of the heavy elements have been built up over time. By the time the Sun and Earth were formed 4.6 billion years ago, over 8.4 billion years of star and planet formation had already taken place in the universe. Star formation still takes place today, so in total there have been over 13 billion years of star and planet formation. Zooming in now to our planet, life started not long after the Earth itself formed, sometime between 3.8 and 3.5 billion years ago (bya). But for almost half the age of the Earth, the only forms of life were microorganisms such as bacteria. More complex life forms started to appear about 1-2 bya. Invertebrates, which appeared some 600 million years ago (mya), were the earliest multicellular life forms, and vertebrates appeared about 500 mya. Life invaded the land about 400 mya. The dinosaurs dominated from 240 mya until their extinction 66 mya, and then mammals gradually took over. Many species came and went. Our closest living relatives are the chimpanzees, which split off from our ancestral line 5-6 mya; our more recent relatives have all become extinct. It is amazing to think how recently humans appeared on the cosmic scene. Our species only appeared about 200,000 years ago, our ancestors emerged out of Africa just 50,000 years ago, agriculture started 10,000 years ago, and we have had modern technology for only the last 100 years or so! We are newcomers to the universe. We now know that there are planets orbiting other stars like our Sun, probably billions of them in our galaxy alone, and billions more in the billions of other galaxies. Given the huge timescale of the universe, any life on those planets is bound to be millions or billions of years more or less advanced than life on Earth. If it is less advanced, it would certainly not be able to communicate with us. If it is more advanced, its technology would probably be totally unrecognisable to us. Nevertheless, we are probably not alone in the universe. Of course the timescales discussed above only cover the ‘conventional’ universe from the Big Bang to now. If there was a ‘preexisting’ multiverse, we have no idea how far back any ‘before’ may extend. And as the expansion of the universe is accelerating, the future of the universe may be very long indeed: trillions upon trillions of years. Peter Shaver obtained a PhD in astrophysics at the University of Sydney in Australia, and spent most of his career as a senior scientist at the European Southern Observatory (ESO), based in Munich. He has authored or co-authored over 250 scientific papers, and edited six books on astronomy and astrophysics. If you’re a fan of science fiction or fantasy then chances are, at some point, you’ve read a book, seen a movie, or watched a series that explored the concept of multiple universes. The idea being that within this thing we call time and space, there are other dimensions where reality differs from our own, sometimes slightly, sometimes radically. Interestingly enough, this idea is not restricted to fiction and fantasy. In science, this is known as the Multiverse Theory, which states that there may be multiple or even an infinite number of universes (including the universe we consistently experience) that together comprise everything that exists: the entirety of space, time, matter, and energy as well as the physical laws and constants that describe them. In this context, multiple universes are often referred to as parallel universes because they exist alongside our own. The term was coined in 1895 by the American philosopher and psychologist William James. However, the scientific basis of it arose from the study of cosmological forces like black holes and problems arising out of the Big Bang theory. For example, within black holes it is believed that a singularity exists – a point at which all physical laws cease – and where it becomes impossible to predict physical behavior. Beyond this point, it is possible that there may be an entirely new set of physical laws, or just slightly different versions of the ones that we know, and that a different universe might exist. Theories like cosmic inflation support this idea, stating that countless universes emerged from the same primordial vacuum after the Big Bang, and that the universe as we know it is just what is observable to us. Max Tegmark’s taxonomy of universes sums up the different theories on multiple universes. IN this model, there are four levels that classify all major schools on thought on the subject. In Level One, different universes are arranged one on top of the other in what is called Hubble Volumes, all having the same physical laws and constants. Though each will likely differ from our own in terms of distribution of matter, there will eventually be Hubble volumes with similar, and even identical, configurations to our own. In Level Two, universes with different physical constants exist and the multiverse as a whole is stretching and will continue to do so forever, but some regions of space stop stretching and form distinct bubbles, like gas pockets in a loaf of rising bread. In Level Three, known as the Many Worlds Interpretation of Quantum Mechanics, observations cannot be predicted absolutely but a range of possible observations exist, each one corresponding to a different universe. Level Four, aka.the Ultimate Ensemble devised by Tegmark himself, considers as equally real all universes that can be defined by mathematical structures. In other words, universes with the same or different constants may exist. 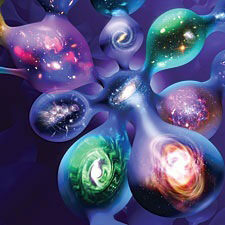 We have written many articles about multiverse for Universe Today. Here’s an article about searching life in the multiverse, and here’s an article about parallel universe. If you’d like more info on the Multiverse, check out some Recent Innovations about the Concept of Universe, and here’s a link to an article about the Size of the Universe. We’ve also recorded an entire episode of Astronomy Cast all about Multiverses. Listen here, Episode 166: Multiverses. Other intelligent and technologically capable alien civilizations may exist in our Universe, but the problems with finding and communicating with them is that they are simply too far away for any meaningful two-way conversations. But what about the prospect of finding if life exists in other universes outside of our own? Theoretical physics has brought us the notion that our single universe is not necessarily all there is. The “multiverse” idea is a hypothetical mega-universe full of numerous smaller universes, including our own. In this month’s Scientific American, Alejandro Jenkins from Florida State University and Gilad Perez, a theorist at the Weizmann Institute of Science in Israel, discuss how multiple other universes—each with its own laws of physics—may have emerged from the same primordial vacuum that gave rise to ours. Assuming they exist, many of those universes may contain intricate structures and perhaps even some forms of life. But the latest theoretical research suggests that our own universe may not be as “finely tuned” for the emergence of life as previously thought. Jenkns and Perez write about a provocative hypothesis known as the anthropic principle, which states that the existence of intelligent life (capable of studying physical processes) imposes constraints on the possible form of the laws of physics. The theory of “cosmic inflation,” which was developed in the 1980s in order to solve certain puzzles about the structure of our universe, predicts that ours is just one of countless universes to emerge from the same primordial vacuum. We have no way of seeing those other universes, although many of the other predictions of cosmic inflation have recently been corroborated by astrophysical measurements. “What theorists like Dr. Perez and I do is tweak the calculations of the fundamental forces in order to predict the resulting effects on possible, alternative universes,” Jenkins said. “Some of these results are easy to predict; for example, if there was no electromagnetic force, there would be no atoms and no chemical bonds. And without gravity, matter wouldn’t coalesce into planets, stars and galaxies. A brief overview of the article is available for free on Scientific American’s website.